We have designed Trias with care & love, basing on our long-term experience in building websites for different businesses. 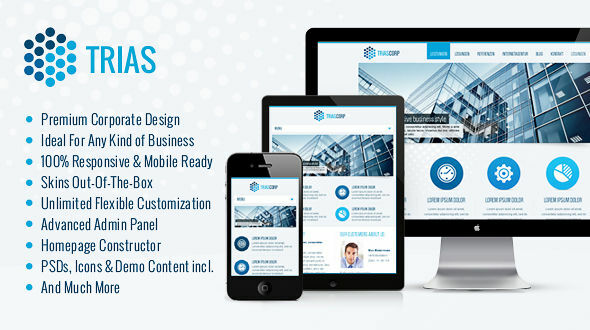 Trias provides you with almost everything your business website could need: company profiles, project/product showcases, flexible impressive slideshows & galleries, news, testimonials, awesome quickfinders with modern flat icons to highlight your activity areas etc. And the best of all is: Trias is fully customizable, but also ready-to-use. Trias will make your website profitable, appearing to your customers in accordance with what they need and what they search for. Customizable backgrounds for sliders, slideshow area, quickfinder, main content, contact panels etc. Tons of shortcodes for any needs: Galleries, Portfolios, Quickfinders, Teams, Styled Boxes, Styled Images, Icons, Tabs, Accordions, Maps, Videos, Divider, Tables, Typography, Buttons, Column Layouts and much more! Please Note: The images (except background patterns and icon set) used on demo website are not included with this theme.